Won a gift voucher for books courtesy Gulf News and picked up 2 books from the Jashanmmal bookstore. 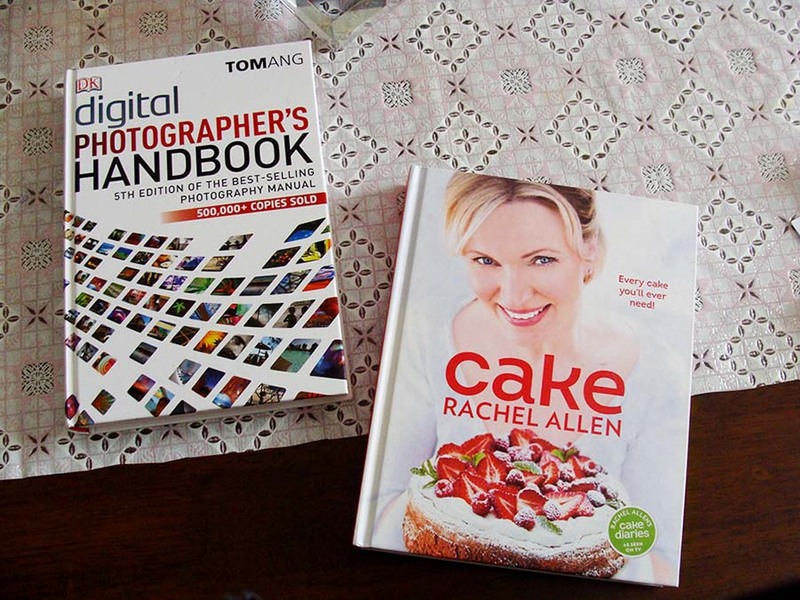 The first one Tom Ang’s 'Digital Photographer’s Handbook' is a must read if you are a budding photographer. I’m so glad I picked it up because it’s written in very simple language and has photographs to illustrate every point made. What a life he must be leading I'm thinking….you know he’s practically visited every country in the world. And takes pictures for a living. Just the kind of life I’m going to lead in my next life. And in that life my husband will be my wife and my kids will be my parents. And I’m gonna give them hell….ohhhh yeaahhhh. Sorry got sidetracked, the other book is Rachel Allen’s 'Cake' which you’ll love if you are a cake maniac like I am. Did you know Rachel Allen was here in Dubai for the Emirates Airline Festival of Literature last month?? I so badly wanted to go watch her in action and get my book autographed at the same time but didn't because I feared she’d ask me how many cakes I baked from the book. I could see myself shrinking in shame because I hadn't made a single one. Well technically speaking it’s not my fault I didn't make anything from the book because every recipe in there contained eggs and here we were observing Lent. Yep, no meat, fish or eggs for 50 DAYS. I knowww….whatever were we thinking??? Those 50 days felt like 50 weeks to me. I freaked trying to dream up different vegetarian dishes every day. I won’t mention the deep sighs & pathetic looks I got each time I served a meal. Not to mention the temptation….a neighbour came over with a huge bowl of fish biriyani one day and my heart broke into two as I sent her away. We also went for one of those horse shows and stoically ate vegetable samosas and pita bread with hummus while the others gorged on chicken pot pies, bacon wrapped shrimps and…and…I can't bear to say more. There are more such sad stories but I’ll leave it to your imagination. To cut the story short, we survived the 50 days of Lent & it went better than expected. Looking back now we are happy we made it through and quite satisfied about the whole thing. Self-control is not easy. We may have cribbed a bit but didn't knowingly do anything to break it. Again and again it comes back to me that almost anything is possible if we put our minds to it. Lao Tzu the Chinese philosopher says “He who controls others may be powerful but he who mastered himself is mightier still”. I wouldn't have found the quote so meaningful if I hadn't been observing the Lent;-P.
Rachel Allen’s book in the meantime is sitting on the book shelf and staring accusingly at me;-(. In other news, I was roped into playing teacher for a week during the holidays again; the Vacation Bible School at church, remember. I gave in without a murmur this year and managed to have a good time too. I had around 15 kids in my class and succeeded in keep them occupied for a few hours everyday. 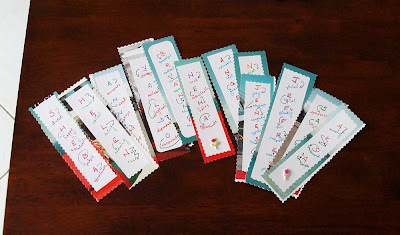 At the end of 7 days I gave them a bookmark each which I painstakingly made for them and threatened them with dire consequences if they lost it. I've also acquired a new position…meet the Manager of the father-in-law’s facebook account. FIL had no clue how to go about on FB and asked for help. The doootiful DIL that I am found it difficult to say no. I’m now posting pictures and updating statuses on a weekly basis and quite enjoying it. FIL is very pleased with all the attention his page is getting and I feel like a master puppeteer controlling the strings of something which is not mine. Never mind my own FB account is lying unattended & gathering dust somewhere. So that’s all in the news from the RBC* today. You have a good day too. Wait….just remembered some more…..you know I usually cut across a park to go to the local grocery and one time when I was coming back from the grocery[back through the park] I saw a worker planting tiny shoots into the ground. He made the mistake of looking up to see who was passing by and out shot my hand expectantly. And alternatively showed him one finger [the index finger you dirty minds] signaling ‘just one piece of the plant please’. He gave me one, then two, then three and four and went to pick the fifth out and I mimed “enough enough, thank you, thank you, beaming happily at him. All those elaborate gestures because he didn't know English and I didn't understand Tagalog. We both went our way feeling very pleased with ourselves:-). Yours posts are full-filling to read. So full of life! I can actually visualize the whole thing. Enjoyed reading it, as always! Making cakes for a million fans[if u say so;-P] is err...a piece of cake but couriering it to various parts of the world would broken us...find me a sponsor and I'm game;-D.
*gasp*I couldn't have done that. You see...one of the Lent rules included 'Thou shall not lie';-o.
p.s: Truth is that I was supposed to get passes but in the last moment got passes for the Shobha De'/Anupam Kher meet. But look at my luck, I fell sick and couldn't attend that also:-(. 6. lent without even eggs, oh my gosh.. thats a real lenten spirit. 7. for all the goodness( i mean the branches) the tagalog speaking guy did to you, he deserves a hug and a kiss and not just elaborate gestures. BTW the flowers are bright and chirpy, i guess like the owner, hey i mean you, not the gardener anymore. :-) :-) what are they called? 2. U remembered*pleased*..no no not the crossword but there's another one regarding books. 3. I told tht to H once, he looked shocked at the very idea of it;-P.
6. U knw my FIL is even more strict...he doesn't take milk products also which really gives no choice at all;-(. 7. 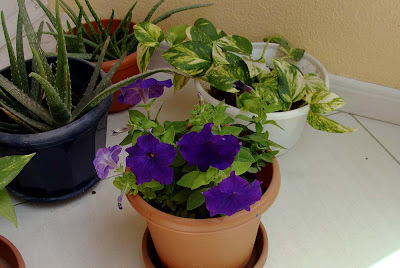 I'm very old-fashioned, I don't hug/kiss at first meeting;-D. I'm not sure but I think it is Petunia:-). Thank U Vincy for the lovely, long comment:-)). oooh really pretty flowers! :) Btw, I had come here to share this link with you http://scratch.mit.edu/ for your little girl, I think she might enjoy this. Hey chked out the site finally...really cool one. Will show it to the kids, thanks Snow:-)). Nice plants.. Heard Dubia has having a sand storm.. my friend just what s apped me may be in on our chats not too long ago. Yeah last week was a dusty one. The sandstorm was just for a few hours but it blew away the chairs and tables of the cafeteria nearby and created such a horrible racket adding to the confusion. All of us trying peek out of our windows but couldn't as the dust blew into our eyes and nose;-P.
I would love to bake from that book !! You should defenitely try !! I made one yesterday...going to ice it today. So far so good. Let's hope the final result is worth it;-D.
Nisha dont pull my leg....none of my pictures are put-up worthy material. And worse I'm not able to go out anywhere to experiment[as in outside] because of the heat. That's wht I've hrd abt Rachel Allen too...always smiling...I have a feeling she'll be back soon and tht time I'm not going to miss it:-)). Those blue flowers are so lovely! Mine is a lost cause;-P.
Baked one yesterday, looks good tho havent tasted it yet. U find the courier and let me knw;-D.
Love the violet flowers ! And great post ! If you need any help with photography books, I can tell the budding photographer at home to share some kindle ebooks. :-) Cake baking yumm! Lucky kids you have ! They will be at the receiving end to all the cake baking trials na? Even if a cake goes wrong it cant be bad...cos it is a cake ! LOL u reminded me of an incident when my mom baked a cake for the 1st time. The cake didnt bake properly and so came out half cooked. My mom was so disappointed and was going to throw her efforts in the trash. My sister & I loved the half cooked yummy 'maav' and begged her not to. We both finished the whole thing in 4-5 days while my mom looked on worried[she thot v'll get stomachache] & disgusted at the same time;-D. Huh....I'm sure there is some terible misunderstanding here. Anita my dear, please go chk it once again;-). anyway.. finally another post is there.. kabhi phursat mile aapki sundar si dunaya se..
Aapke liyae fursat hi fursat hai. lovely, lovely flowers nance! you have quite the green thumb. waiting to see cakes from the book. btw, cool bookmarks too! hi, first thank u for dropping by my space. I loved ur writing.....I couldn't help smiling at managing ur FIL's Facebook account. I do it for my mum:) am ur new follower. Btw,the pics on ur blog are lovely and tasteful:) am sure u will love the yeast cookies. Rachel Allen is my fav. chef.. shes so amazing in her baking style.. i just keep looking at those pictures of her cakes and i love baking too..
Hehe the sidetracked train of thought is always more interesting than the normal;-D.
The problem with having too many plants is the dilemma as to what to do with them when we have to go on vacation. A few years back my entire collection dried up because I cdn't find anybody to care of them when I went on holiday:-(.